Let me introduce you to Pro Prep. Pro Prep is a unique and proven concept that is essential in the development and refinement of future professional prospects. This concept is designed to enhance a player’s position in the NFL Draft. Pro Prep can also be used as a recruiting device in the procurement of prospective NFL players. Potential NFL prospects must have the necessary physical qualities of size, speed, athletic ability, skills relative to position and they must produce on the field. They are thoroughly scouted during their college career. Following their Senior season the players are categorized as to the rounds where they will be drafted. A player can improve his draft status by having an outstanding workout prior to the draft. Having been a personnel executive for 30 years in the NFL, I witnessed numerous times after a player’s interview by our Head Coach and myself that the player failed to present himself in a proper manner. The Head Coach would then inform me that he does not want that particular player on our team. Somewhere during the interview process the player said the wrong things and did not present himself in a professional manner. This was always difficult for me to then get that player placed on the draft board in the proper order. In most cases the player was not a consideration in our draft selection process. This is where I come into play. I start with a two hour seminar with the players I will be working with. 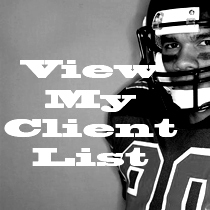 I cover everything that a player should know from the time he leaves college football to the day he leaves professional football. Each player is then taken individually for two hours and put through an interview process. I prep the players on the questions and answers to ensure that they make the proper presentation. Each player is also shown videos of past Combine interviews and the mistakes the players have made in the past. The individual player is then taped to see how he performs in a live interview and where improvement is necessary.